WGNC is pleased to host South Carolina artist Ashley Harwood for a public demonstration and three day-long workshops, April 14-17. You may have seen Harwood demonstrate at AAW last summer and more recently at the NC symposium in Greensboro. She will do a public bowl-turning demonstration at our April 14 meeting, to be followed by 3 day-long workshops open to WGNC members and NC State students. Only 10 slots are available for each day. The workshop topics and dates are as follows. You can follow the links to reserve and purchase your slots, or see Chris Boerner and Steve Criscenzo during our meetings. The cost is $110 per day, with a $3 processing fee added for the online purchase. Before pursuing a career as a woodturner, Ashley Harwood studied glassblowing, neon-tube bending, and sculpture and installation art, for which she received a BFA from Carnegie Mellon. She teaches woodturning at her studio in Charleston, South Carolina, and has demonstrated in a number of professional venues throughout the U.S. and abroad. Here are descriptions of two topics she covered at eh 2015 AAW symposium in Pittsburgh. "Rim and Foot Design on a Bowl: Ashley will review different bowl designs that can be executed completely on the lathe. 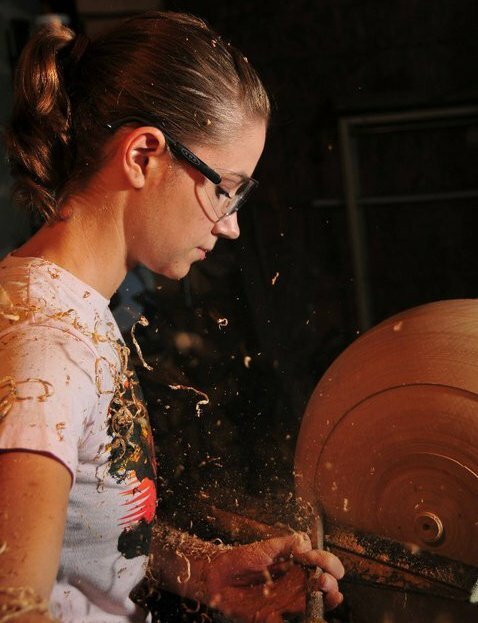 She will turn the outside of a bowl using the Push-Cut method and show various design elements that can be added to the rim and/or foot of a bowl on the lathe. Watch her demonstrate how to use and sharpen a bowl gouge, vortex tool, and negative rake scrapers to add details to the bowl. She’ll discuss design aesthetics, e.g., bowl shape and curve, proportion of the foot, and creating rim and foot designs that work together. Ashley will address how to sand the bowl without dulling sharp details." "Jewelry: Ashley will discuss different designs for woodturned jewelry and jewelry design basics. She will explain the techniques used for cutting basic shapes on a larger piece of wood before demonstrating how to turn fine beads out of ebony and finish them to a smooth luster. She will use a bowl gouge, detail spindle gouge, vortex tool, and small drill bits held in the Jacob’s chuck and a pin vise. By combining multiple small elements, it is easy to create elegant and timeless designs that can be worn for many occasions. Ashley will demonstrate basic techniques to assemble jewelry using chains, clasps, and wire and will show how to create more complex pieces using multi-axis and off-center turning on a small scale." Tools: A chuck with pin jaws is required, but there is no information on spindle size noted. I guess we might want our chuck to fit the lathe used. What will be the schedule of the workshops? Start time? Lunch break time? End of day time? We got a bit busy with Ashley's visit and I did not see this post. As you know, we reached out to all participants via email before the sessions. If you need a timely response, please be sure to email questions to wgnc@ncturning.com. This forum is for general sharing and while I check in from time to time, the group's participation has been too low to merit constant monitoring. When we do workshops, we're always using mini lathes with 1" 8tpi threads and #2 morse tapers. It's the only type that we, NCSTATE or even Woodraft, own in a large enough volume to support a group/class. Classes almost always run from 9 to 5, but usually wrap up each day closer to 4pm. We don't provide lunch, but when we run these workshops at the CraftsCenter the group always walks over to the university cafeteria around the corner, at a time they or the instructor chooses.